The Oxnard Financial Plaza Towers include the tallest building in Ventura County; its 22nd floor home to the Tower Club. Located at 300 East Esplanade Drive in the city of Oxnard, it is sometimes also known as the Morgan Stanley Building or Topa Financial Plaza II. Adjacent to the 101 Freeway, N. Oxnard Boulevard and the new mixed development of Riverpark, this office building has many attractive features. 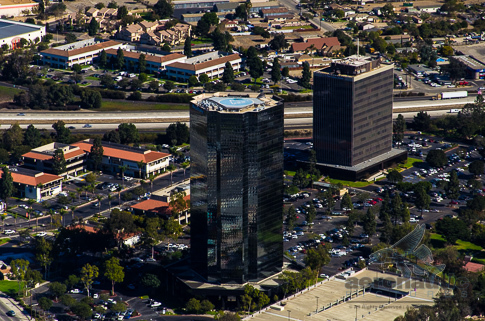 NOTE: We have additional aerial views of the Oxnard, Riverpark and the Oxnard Financial Plaza Towers. Please contact us to see samples. Download this high resolution Ventura County stock photo today.